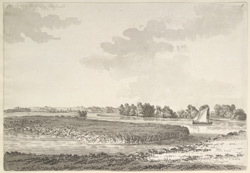 A view in ink of the junction of the rivers Isis and Cherwell, by Christ Church Meadows in Oxford, drawn by S.H. Grimm. The River Cherwell rises in Northamptonshire, enters Oxfordshire near Claydon and meet up with the Isis, just south of Oxford. The Isis then goes on to meet the River Thame at Dorchester, where it becomes the River Thames and heads off to London.